The versatile 2018 Honda HR-V is perfect for city driving with a size that’s friendly to street parking, and its fuel-sipping is easy on the pocket. Up against a new competitor, the 2018 Toyota C-HR, we think the choice quickly becomes clear. The Honda HR-V has more advantages, from luxury features to fuel economy and space. We put the two side-by-side so you can see why the HR-V comes out on top before you meet it in person at Honda of Greeley! Drivers love compact crossovers for all types of reasons. Peppy performance and a versatile interior make it a smart choice for many types of drivers, and while both the new Honda HR-V and Toyota C-HR offer many great features, the Honda HR-V simply has the edge in specs and features! Performance: The Honda HR-V is powered by a 4-cylinder engine that’s capable of handling the size of a crossover while giving you up to 34 mpg/highway and 28 mpg/city with a continuously variable transmission and front-wheel drive in EPA estimates. * The Toyota C-HR, on the other hand, has a 4-cylinder engine that tops out at 31 mpg/highway and 27 mpg/city with a CVT and front-wheel drive in EPA estimates. * Moreover, while the Honda HR-V comes with available AWD, the Toyota C-HR does not. Cabin Comfort: For a 2018 model, you rightfully expect a certain level of amenities even if you’re buying on a budget. The Honda HR-V EX-L trim gives you an integrated navigation system, leather-trimmed seats, a power moonroof, and SiriusXM Radio. The Toyota C-HR Premium? Don’t expect any of the above—those features aren’t included in any trim. Interior Space: Again, the proof is in the numbers. While both crossovers seat five passengers, the Honda HR-V LX has much more room for everyone to hop in with 100.1 cubic feet in its passenger area—much more than the 83.8 cubic feet of the C-HR. The Honda HR-V also has 23.2 cubic feet of cargo room behind the split-folding rear seat or up to 57.6 cubic feet of room with the seat folded down. Compare this to the Toyota C-HR’s 19 cubic feet in the trunk area or a max cargo capacity that comes up short with just 36.4 cubic feet of available space. Still not convinced? 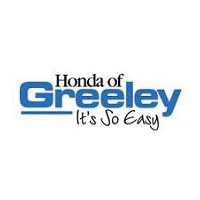 Take a tour of the 2018 Honda HR-V at Honda of Greeley by scheduling an appointment for a test drive. Call our sales team at (970) 506-2791, and we’ll be happy to answer your questions. Don’t put off finding your next crossover. We’ll make the process easy with in-house financing and a welcoming service center to take care of you for years to come. Comments or questions? Contact us online today!